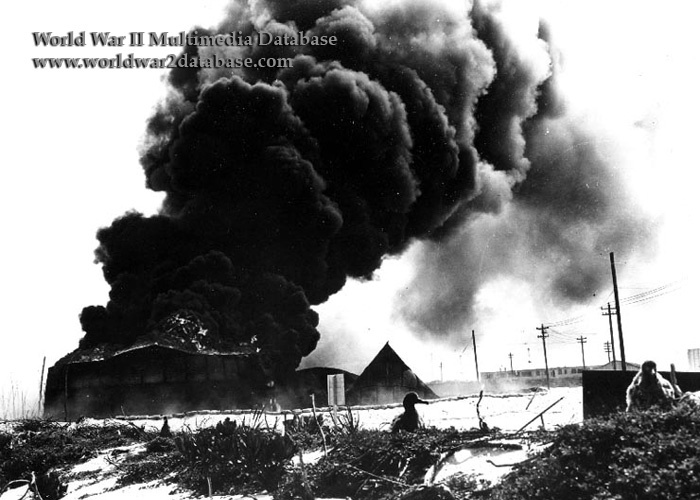 Burning oil tanks on Sand Island, Midway, following the Japanese air attack delivered on the morning of June 4, 1942. These tanks were located near what was then the southern shore of Sand Island. This view looks inland from the vicinity of the beach. Three Laysan Albatross ("Gooney Bird") chicks are visible in the foreground. At roughly 0630 Hours, a total of 108 planes, Aichi D3A type 99 (Allied code name "Val") carrier bombers and Nakajima B5N2 (Allied code name "Kate") torpedo planes, supported by numerous A6M2 fighters (Allied code name "Zekes"), bombed Midway Island installations. Although defending VMF-221's Brewster F2A Buffalo and Grumman F4F Wildcat fighters lost seventeen of 26 aloft. The first bomb fell on Midway at 0630. In spite of heavy antiaircraft fire, the enemy formations continued their run, dropping their bombs along the north side of Eastern Island, and on Sand Island in the hangar and barracks area and near "D" battery. Scarcely had the high-altitude attack passed when Aichi dive bombers appeared. The powerhouse on Eastern Island and the oil tanks near the Marine dock on Sand Island were primary targets and were hit. Smoke from the burning oil tanks interfered somewhat with antiaircraft fire. As the dive bombers pulled out over the lagoon, the PT boats opened fire on them with all their guns, and at least one plane crashed some distance beyond. The bombing was over in a few minutes, but a few Zeros remained strafing the field and the batteries. Motor Torpedo Boat PT-25 was also damaged by strafing in Midway lagoon. The Americans estimated that they had shot down 43 aircraft, but only four were actually destroyed during the air raid. 63 were so badly damaged that they could not fly again.